The researchers observed in an HOIP a "richness" of semiconducting physics created by what could be described as electrons dancing on chemical underpinnings that wobble like a funhouse floor in an earthquake. That bucks conventional wisdom because established semiconductors rely upon rigidly stable chemical foundations, that is to say, quieter molecular frameworks, to produce the desired quantum properties. "These lattices are structurally not very complex," Silva said. "They're only one atom thin, and they have strict two-dimensional properties, so they're much more rigid." "You forcefully limit these systems to two dimensions," said Srimath Kandada, who is a Marie Curie International Fellow at Georgia Tech and the Italian Institute of Technology. "The atoms are arranged in infinitely expansive, flat sheets, and then these very interesting and desirable optoelectronic properties emerge." "One of the compelling advantages is that they're all made using low-temperature processing from solutions," Silva said. "It takes much less energy to make them." By contrast, graphene-based materials are produced at high temperatures in small amounts that can be tedious to work with. "With this stuff (HOIPs), you can make big batches in solution and coat a whole window with it if you want to," Silva said. For all an HOIP's wobbling, it's also a very ordered lattice with its own kind of rigidity, though less limiting than in the customary two-dimensional materials. "It's not just a single layer," Srimath Kandada said. "There is a very specific perovskite-like geometry." Perovskite refers to the shape of an HOIPs crystal lattice, which is a layered scaffolding. "The hole is thought of as a positive charge, and of course, the electron has a negative charge," Silva said. "So, hole and electron attract each other." The electrons and holes race around each other like dance partners pairing up to what physicists call an "exciton." Excitons act and look a lot like particles themselves, though they're not really particles. 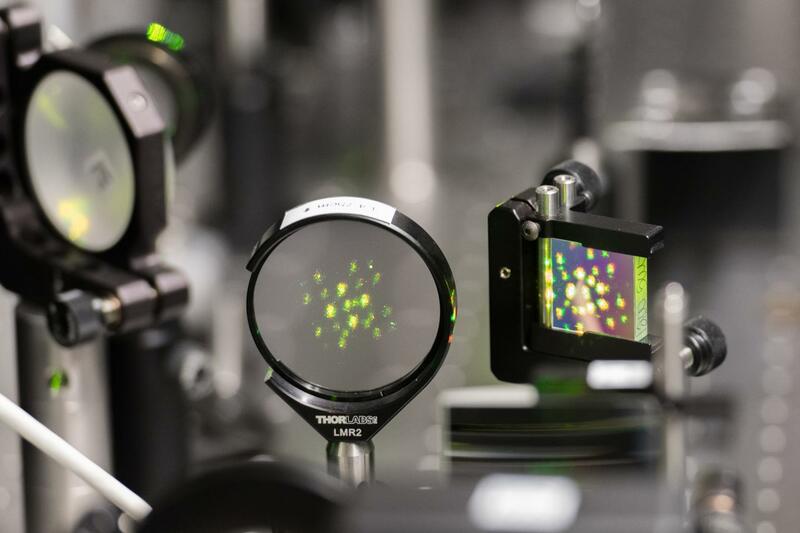 In semiconductors, millions of excitons are correlated, or choreographed, with each other, which makes for desirable properties, when an energy source like electricity or laser light is applied. Additionally, excitons can pair up to form biexcitons, boosting the semiconductor's energetic properties. Coauthors of this paper were Stefanie Neutzner and Annamaria Petrozza from the Italian Institute of Technology (IIT); Daniele Cortecchia from IIT and Nanyang Technological University (NTU), Singapore; Cesare Soci from the Centre for Disruptive Photonic Technologies, Singapore; Teddy Salim and Yeng Ming Lam from NTU; and Vlad Dragomir and Richard Leonelli from the University of Montreal. The research was funded by: The EU Horizon 2020's Curie Fellowship (project 705874); the EU 2020 Research and Innovation Program (Grant #643238 SYNCHRONICS); the Natural Sciences and Engineering Research Council of Canada and Fond Québécois pour la Recherche: Nature et Technologies; the Canadian Foundation for Innovation, the Natural Science and Engineering Research Council of Canada; and the National Research Foundation of Singapore (NRF-CRP14-2014-03). Any findings and opinions are those of the authors and not necessarily of the funding agencies.